Reply, to John Buchan, 'For Mrs Cathcart' mainly concerning cold bathing. The original letter, of which this entry is a summary, as delivered is now in the Scottish Records Office at GD:180/654/3. Summary Reply, to John Buchan, 'For Mrs Cathcart' mainly concerning cold bathing. 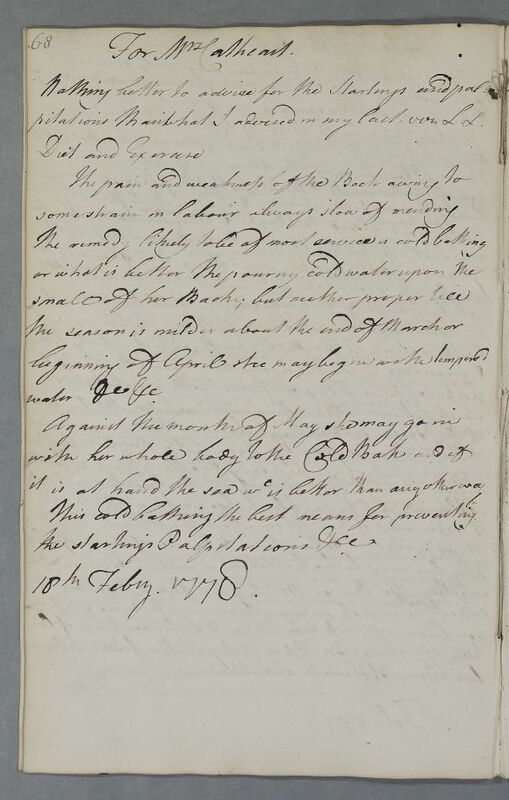 The original letter, of which this entry is a summary, as delivered is now in the Scottish Records Office at GD:180/654/3. Case of Mrs Cathcart who has back pain after labour, and corresponds with Cullen through her brother John Buchan, then situated in Edinburgh. pitations than what I advised in my last viz L. L.